Elliot J. Schrage (born July 27, 1960) is an American lawyer and business executive. He was vice president of global communications, marketing, and public policy at Facebook until 15 June 2018, where he directed the company's government affairs and public relations efforts. Schrage tasked a Republican-affiliated PR firm to push negative narratives about Facebook's competitors, namely Apple and Google. Schrage was born to a Jewish family and holds degrees from Harvard Law School (J.D. 1986), the John F. Kennedy School of Government (M.P.P. 1986), and Harvard College (A.B. 1981). He also studied at the École Normale Supérieure in Paris, France. Schrage began his legal career with Sullivan & Cromwell, where he specialized in U.S. securities offerings, mergers and acquisitions, and corporate transactions, including project financing for the Euro Disneyland theme park. He then worked as managing director of the New York office of Clark & Weinstock, a public policy and management consulting firm. Since 1990, Schrage also served as adjunct professor at Columbia Business School, where he taught a seminar that "explores the intersection of international human rights law and multinational business practices", and Columbia Law School. 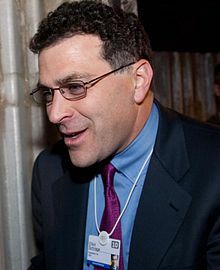 Schrage served as the Bernard L. Schwarz Senior Fellow in Business and Foreign Policy at the Council on Foreign Relations and also worked at Gap, Inc., as the senior vice president for global communications. On October 31, 2005, it was announced that Schrage had joined Google as Vice President, Global Communications and Public Affairs. Upon joining Google, Schrage inherited the company's controversy regarding censoring search results in China. On February 15, 2006, he testified in front of the United States House Committee on International Relations on behalf of Google on the subject of Internet in the People's Republic of China. On May 12, 2010, The New York Times published a Q&A with Schrage, where he answered readers' questions. The interview was panned and negatively rated in the press, with Schrage attracting criticism for his poor handling of Facebook's privacy policies. On June 14, 2018, he announced his intention to resign from his position at Facebook. Schrage was succeeded by former British Deputy Prime Minister and leader of the Liberal Democrats Nick Clegg. Schrage has served on the American Association for the Advancement of Science's Committee on Scientific Freedom and Human Rights, and the U.S. Department of Treasury Advisory Committee on International Child Labor Enforcement. His board experience includes serving as a trustee of the Harvard Law School Association of New York, Director of the International League for Human Rights, and the Director of the Medicare Beneficiaries Defense Fund. Schrage, his wife, and his children reside in San Francisco, California. ^ a b "Google Names Elliot Schrage Vice President of Global Communications and Public Affairs" (Press release). Google. October 31, 2005. ^ "Elliot Schrage, Executive Profile". Bloomberg.com. Bloomberg. Retrieved 22 September 2016. ^ Eldon, Eric (24 June 2010). "Facebook Hires White House Staffer for Global Policy Position". Social Times. AdWeek. Retrieved 22 September 2016. ^ Schrage, Elliot (November 21, 2018). "Elliot Schrage on Definers". Facebook News. Being Jewish is a core part of who I am and our company stands firmly against hate. ^ Schrage, Elliot (Summer 2000). "Child Labor & Exploitation". Journal of Civil Rights and Economic Development. 14 (3): 405. Retrieved 29 July 2017. ^ "Dean's Council". Harvard Kennedy School. Archived from the original on 29 July 2017. Retrieved 29 July 2017. ^ a b c Foremski, Tom (2 November 2005). "Google hires squeaky clean human rights/ corporate responsibility lawyer as PR chief: Is GOOG expecting more trouble ahead? Will Mr. Schrage spearhead GOOG's attack on China's human rights abuses?". Silicon Valley Watcher. ^ "Google ranks censorship as a trade issue". The Independent. 2006-02-16. Retrieved 2017-03-16. ^ Roettgers, Janko (2018-06-14). "Facebook Communications Head Elliot Schrage Is Leaving". Variety. Retrieved 2018-10-19. ^ Sweney, Mark (2018-10-19). "Facebook hires Nick Clegg as head of global affairs". the Guardian. Retrieved 2018-10-19.